statstrac is an open source NFL statistics platform that provides detailed data visualization of rankings, scores, games, trends, teams, and players. I originally started exploring this project mid year when I was thinking about joining a fantasy football league and realized that I knew almost nothing about the statistics side of the game. Before starting this project I wasn't really a dataset guy but now that I see all the flexibility and opportunity they can hold I totally am. 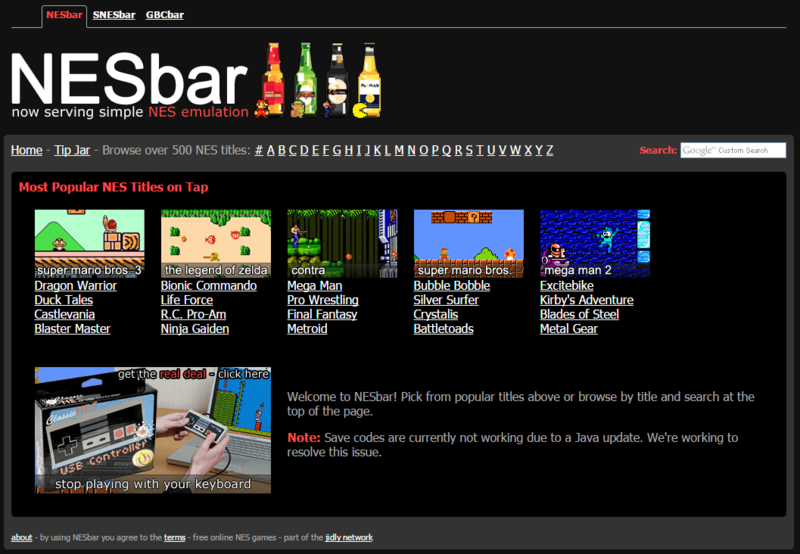 statstrac is no where close to being finished - bugs do exist and there's just still so much to do! 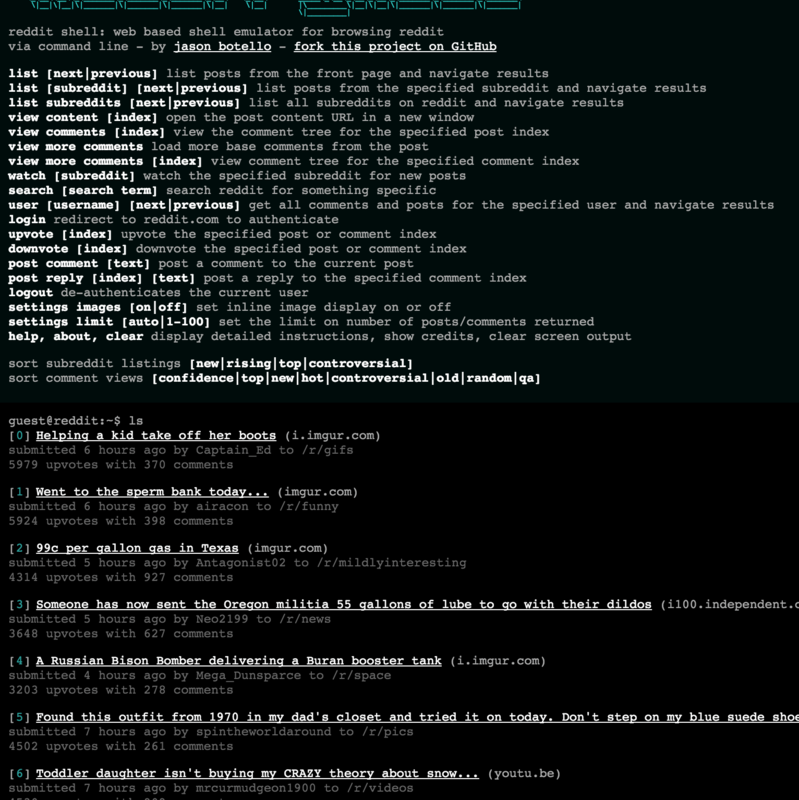 Because reddit has such a fantastic API, there wasn't that much legwork to do on this one. The SSH emulation was already accomplished with an existing library so the rest was just organizing and building out the different requests to make based on specific commands. I also made an identical version for Product Hunt at producthuntshell.com. channel PEAR is a media platform that lets you discover and watch content from around the world on your favorite devices. 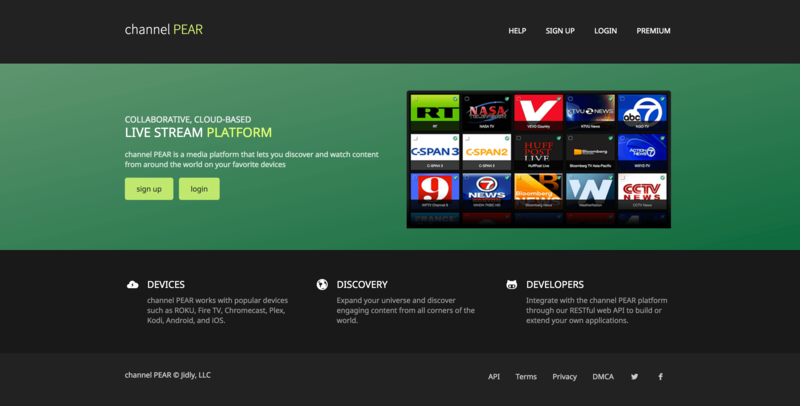 Each user gets access to a library that they can sync with popular streaming devices such as Roku, Fire TV, Chromecast, etc. channel PEAR was built on a LAMP stack that has been heavily modified for high traffic performance and runs on a powerful internal API. It also has a public API that developers can utilize. 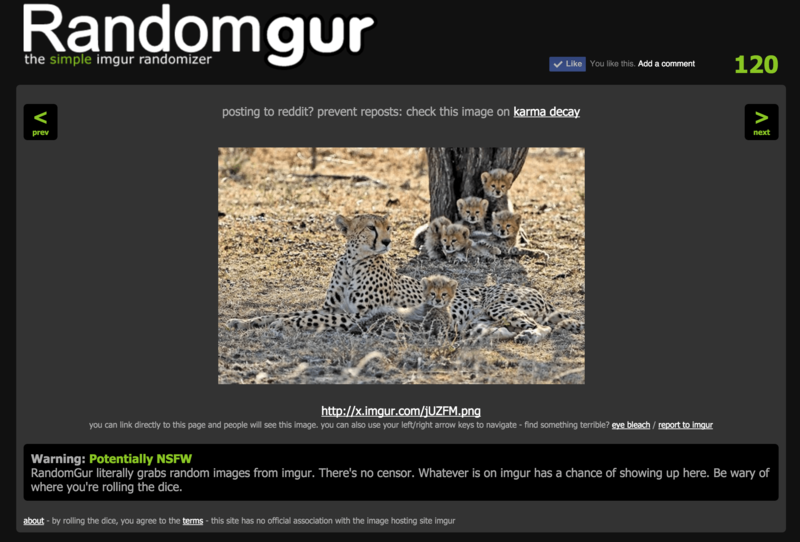 Randomgur shows you a random image from Imgur each time you "roll the dice". The catch is that you never know what kind of image you're going to get - it could be a cute kitten or a dismembered head. (lovely) Imgur now has it's own random feature so this small project is redundant. The concept is simple. Imgur assigns a unique ID to every image it hosts, so first we generate our own unique ID that complies with the constraints Imgur uses (I think it was a 6 character alphanumeric string) and then check if that ID exists or not. If it does, we show the image, if not we generate another ID to check. Randomgur keeps score so you know how many times you've rolled the dice and a history so you can navigate to a previous image. Take My Paycheck (originally That's Why I'm Broke) was my first experiment with affiliate marketing. 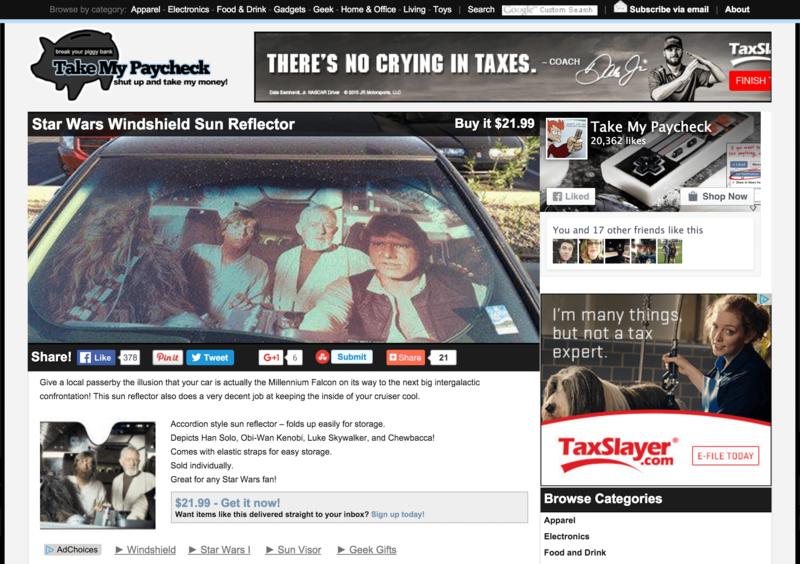 While not an original idea, the goal was to create a geeky, curated version of SkyMall where it becomes addicting to browse the site and discover cool stuff that inspires "impulse buy" feelings. 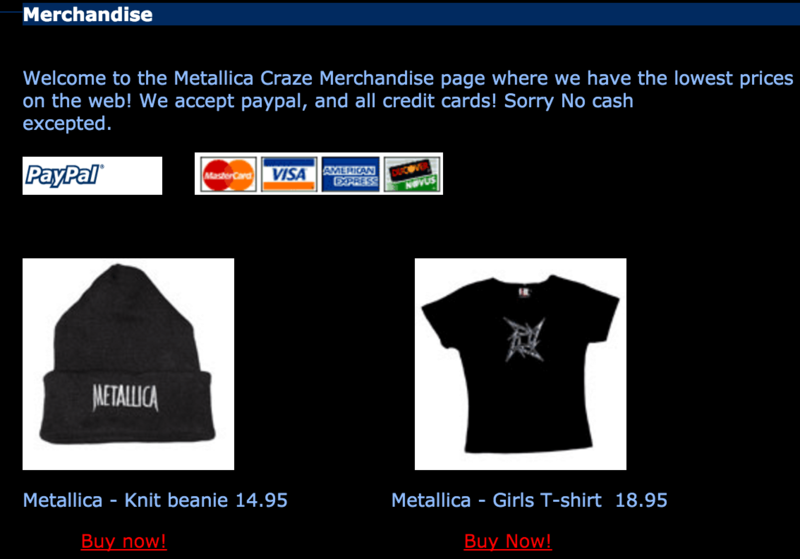 (See the meme: shut up and take my money) The products all appeal to a specific niche and all earn affiliate revenue whenever someone makes a purchase after being redirected from the site. Development wise, Take My Paycheck is one of the most boring sites I've ever built. It uses WordPress (don't hate me) and was built off a base theme that I eventually gutted entirely and rebuilt with the features I wanted. My Counter-Strike 1.6 years! So after spending countless hours playing the game, I decided to run my own game server and offer special permissions to users who paid monthly for them. Again, keeping my eye on that revenue stream... Anyways, CS-Impact.com is where I'd direct people to and they'd be able to register and purchase from there. The first server I setup was on my Dad's old Toshiba laptop that I kept under my bed to muffle the fan noise at night. The lag was unbelievable. 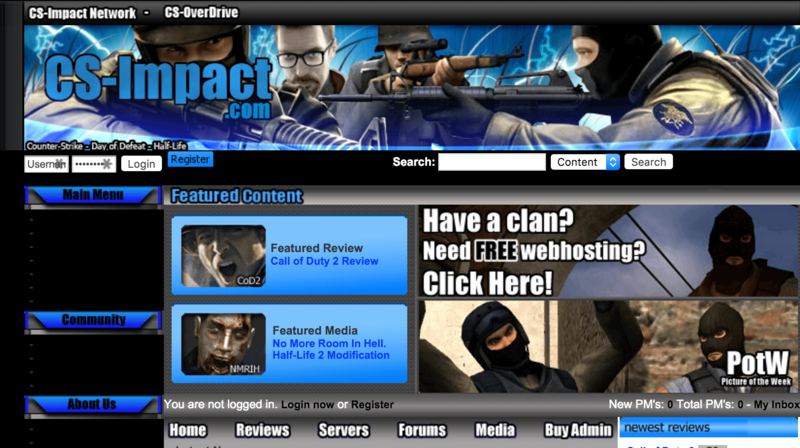 I purchased a hosted server after I managed to get a decent number of regular subscribers. This is also when I first started experimenting in PhotoShop. Tutorials were my best friend until I started to learn which tools could produce a certain effect. 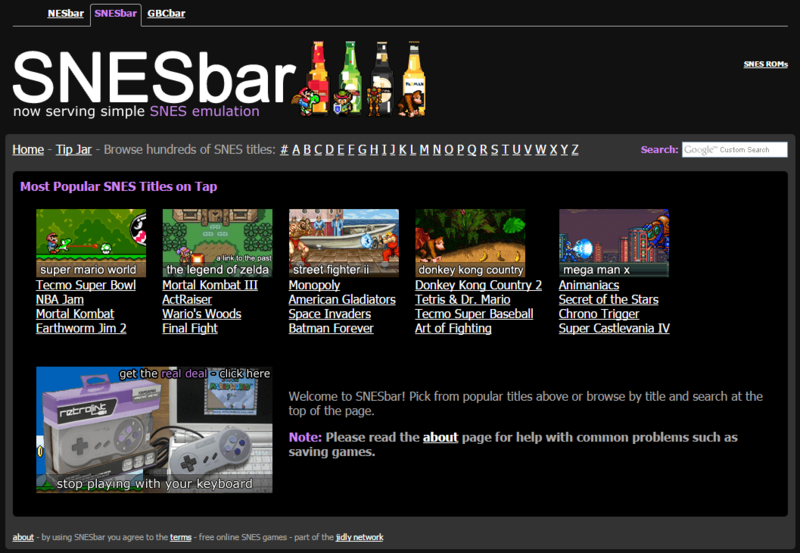 Some of the assets are broken on the Internet Archive snapshot but you can still get a good idea of how it looked. 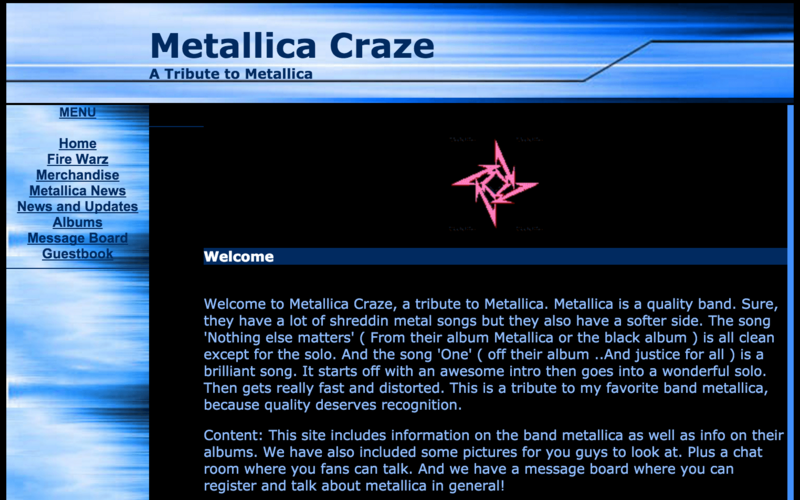 My first awkward and ugly steps into web development (if you can even call it that) happened when I was 12 years old and took the form of a Metallica fan site. Yep. Remember when .tk domains were a thing? Yeah no one else does either.